Note: The following is Part 4 of THE BATTLE OF CORINTH. We recommend that you read Part 1, Part 2, and Part 3, first. Xena was upset that her army was so totally disorganized by the attack on Megara that she was forced to take time to rest and reorganize. Against her orders, the town had been sacked and there had been much unwarranted slaughter. The Thesalians in her forces were the most brutal. No centaur survived the onslaught. No human survived either for many of them had been killed for being Centaur lovers. Xena's headquarters Cavalry troop spent hours as provost marshals rounding up the runaway troops. Xena herself was involved in this effort. By the late afternoon some semblance of order had been restored but the opportunity to continue the pursuit had been lost. Xena had been forced to exercise extreme brutality to enforce discipline. One full battalion of Thesalian infantry was decimated, Xena herself committing most of the executions. According to the scrolls this was a new unit recently recruited and trained outside of the Warrior Princess' presence. Xena ordered the decimation of the unit starting with the outfit's commander who Xena beheaded herself. The person being interviewed went on to say that the unit went on to be one of her best infantry outfits, such was the power of Xena's displeasure. Xena's next task was to get the army to Corinth. This is not as easy as it sounds for the Isthmus is very mountainous and the only decent road, along the southern coast, is bordered by a cliff on its right flank for nearly its entire length. A small force of defenders could make the passage nearly impossible. Xena had been depending on chasing the Centaurs all the way to Corinth but now she had to face the possibility of having to force a bottleneck by combat. Xena then reorganized the army. The wing cavalry screens were returned to the main force and the army was divided into three wings. One of Xena's great talents as a general besides her powerful personal leadership was her eye for terrain. She was the first general known who used the cover provided by the terrain to screen her movements. She also knew the Centaurs well. Tyldus was sure to divide his army into two wings. One wing was to block the northern coastal road at Lautraki while the bulk of his army would block the main southern coastal road at Isthmia. This would leave the center of Tyldus' position vulnerable. Tyldus had good reason for this deployment. He thought that the high mountains and the woods of the central Isthmus was impassable to any sort of army. Therefore, Xena undertook steps that would smash Tyldus' misconception and start his army on a rout that would last for nearly four days and leave Xena in command of the Corinth plain. Thus went the planning for one of the most remarkable forced marches of antiquity. Xena marched thirty eight thousand infantrymen through the high and heavily wooded Isthmus via a small net of mountain paths to strike at what is the present town of Lautroki, a small crossroads village between Isthmia and Lautraki. It was this kind of movement that enhanced Xena's fearsome reputation. Nothing like this march had ever been attempted. No Greek General pursued so ruthlessly, no Greek general cared less about the trappings of military honor. No Greek General maneuvered so violently. Xena cared about one thing, victory at the lowest possible cost. To that end, she always carefully prepared her offensives. Xena had known about the high mountain tracks in the Isthmus for some time. She had personally reconnoitered the area the previous year and had brought along an engineer who was an expert map maker. Many of the people that she sent into the territories of her enemies for intelligence purposes were experienced troops who could provide information about road nets, other terrain features, supply availability and the like. One thing is for sure, no general in history, let alone ancient history, was able to make so many effective night marches. Indeed Xena's army seemed to own the night much like the Coalition forces did during the Gulf War of 1991. Perhaps she was indeed the Daughter of Ares as some of her enemies claimed. "What was necessary was to pin Tyldus into a vulnerable position. Intelligence reports supported my idea that Tyldus had indeed divided his force to cover both coastal roads. Therefore, what was necessary was to guarantee that his forces stay where they were. I ordered ten of my best men from my personal guard to be given false movement orders showing that the bulk of the army would be taking the southern coast road while the remainder would be taking the north. In reality, I would lead the army into the center of the Centaur position using the most difficult path possible to interpose myself between the two wings of Tyldus army. I would then annihilate each wing in detail. Tyldus had yet to learn that the most important thing in war is picking the key point and concentrating one's power there. I resolved to teach him this lesson." Darfus was put in command of a wing of 11,000 infantry. His orders were to drive up the southern coastal road to Isthmia with the objective of pinning Tyldus' main force to that road. Additionally, it would be a great bonus if Darfus could make such an effective demonstration so that Tyldus would be convinced that the main body of the army was coming up the coastal road and force the Centaur king to commit reserves in this area. A Nubian cavalryman, one Marcus, who was to become very well known as a weapons dealer and expert was placed in command of the bulk of Xena's cavalry. His orders were to go along the northern coastal road, secure the shoreline and then turn south and pin the northern wing of Tyldus' army in Loutraki. Once the center attack had gone in, he was to pursue the Centaurs if they broke or support further attacks on Isthmia if Tyldus forces stood. The offensive jumped off just after midnight under a full moon. Xena ordered the campfires of the entire army to be built up in order to seem that the army intended to stay for a considerable period. Xena also ordered that all camp baggage be left behind and the tents not stricken. She then followed the cavalry up the northwestern road into the woods of the isthmus. Darfus was ordered to take whatever measures to convince possible scouts and spies from Tyldus that the entire army remained at Megara. Then they were to march at dawn up the southern coastal road and engage the enemy. Horses were hitched to bundles of brush to act as brooms which would generate huge clouds of dust further magnifying the illusion. Darfus had his cavalry sweep the immediate area west of Megara to round up any observers and screen Xena's movements. The march proved to be difficult but not impossible. Once Xena succeeded in finding the paths she was able to get nearly all of the 38,000 in her command to its assembly area just to the east of the western margin of the Isthmus woods. The troops arrived there in the early afternoon. This would allow a few hours rest and a cold meal to the troops before the planned jumpoff time of just before sunset. To the south Xena could hear the noises of battle and she went south to observe developments. She saw that in general her plan had worked. There were significant troops in the Lautroki area but no more than was necessary to garrison the town. The great bulk of Tyldus' army was to the south and east of the town, apparently heavily engaged with Darfus. After climbing a tree with a good view to the south, she determined that the plan was indeed working, for she saw forces from Tyldus rear being marshaled and then pushed east. At that moment, a rider from Marcus' headquarters arrived, reported that that officer had indeed engaged Tyldus' forces north of Loutraki and that surprisingly they were making good progress towards that town. On receipt of that information, Xena rode back to the army's woodland assembly area and aroused her men and assembled them just east of the margin of the woods. Here unfortunately much information is lost due to corrosion in the scrolls, but what can be picked up from the writings of the unknown bard indicated that the mass of Xena's men attacked just as Tyldus had been seen to commit his final reserve to the fight against Darfus. 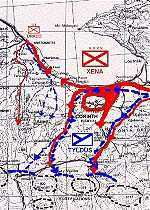 Approximately one third of Xena's attack force turned north into the rear of Tyldus's forces at Loutraki to surround that flank and to support Marcus. The main force drove south to Lautroki and to the southern coastal road deep in the rear of Tyldus' main army. Large groups of archers were peeled off the main infantry group to provide support to the southern charge Massed flights of arrows wreaked heavy casualties on the unsuspecting men-horses. Just as Xena had hoped, when the Centaurs discovered that a huge force lay in their rear threatening their line of retreat, Tyldus' army broke and began to flee westward. Unfortunately for the Warrior Princess, the terrain had forced her to send the bulk of her Cavalry to the north when she could have used it in the center to ride down the panicked Centaurs. However, as it was, a significant action did break out and some heavy fighting did ensue near the town of Isthmia. However Xena's infantry apparently did not attack in a firm formation while the Centaurs fell back upon their training despite their panic and solid blocks of Centaur troops were able to bull their way through the thickening cordon of Xena's men. Darfus had performed well. His infantry and his small cavalry force charged the moment that the Centaur army broke causing heavy casualties. The northern wing of the assault was entirely successful. Some two thousand Centaurs were surrounded and cut off. Marcus sent a deputation to the surrounded part of Tyldus' army to demand that they surrender. Noting that Xena's men had little truck with centaur prisoners, this request was refused and the Centaurs began to try to fight their way out of the pocket. This was a gallant failure. Marcus' vast superiority in mobile troops hammered the Centaurs into the anvil of Xena's infantry in the rear leading to the utter annihilation of the defenders of Loutraki. When this action was complete, Xena ordered her entire cavalry arm to pursue Tyldus and to not let up until he was destroyed. This pursuit Marcus conducted with enthusiasm and ruthless efficiency. The northern amphibious assault that was planned for the port of Aristonautes was jinxed from the beginning. The storm that had allowed Xena to launch her Corinth campaign in secrecy and granted her total surprise at Megara confronted Draco, the force's commander, with strong southerly winds which effectively pinned his armada to the northern shore of the Corinthian Gulf. The winds were powerful enough that it was impossible for the galleys that made up most of the shipping he had his forces upon unable to row against it. The severe wind and sea conditions lasted for seventy two hours. Finally, the fleet succeeded in weighing anchor with two thousand troops of all arms. Sadly all of the troops had been loaded aboard ship three days earlier and were cramped, tired and seasick. This was to have a profound effect on the conduct of the upcoming battle. In the hopes of seaborne reinforcements from Argos, Sisyphus had hoped that this small port on the Corinthian Gulf could be held. Tyldus had warned Sisyphus about Xena's use of surprise seaborne landings in the past to help her outflank his troops in Thesaly. Therefore it seemed that in he light of the large flotilla of ships that had gathered across the Gulf, a major amphibious assault was a definite possibility. Tyldus recommended to the Corinthian king that he send eight hundred of his personal guard to garrison the town. These troops were some of the most experienced and well trained of all the Centaurs. They would prove to be a huge surprise to Draco. Draco's fleet finally arrived off the port but the fleet was in not in very good condition. Contrary winds had made keeping the fleet together very difficult and as it was, the ships arrived in small groups rather than in the compact mass that had been envisioned. Initially this didn't seem to be a problem since the town appeared to be deserted. Draco then landed the initial force on the beach immediately west of town. Fortunately, he was able to disembark about five hundred troops when he was confronted with the surprise of his life. Barrels of burning pine tar came flying out of the town, thrown by catapults Tyldus had constructed in wooden revetments in the town. The tar barrels were followed up by an extremely accurate bombardment by arrows. This surprise bombardment was followed up by a charge of about three hundred elite Centaur troops that threatened to throw the landing force into a panic and Dunkirk Draco then and there. Vicious fighting occurred on the beach for about a half an hour when Draco finally caught a break. His two hundred cavalrymen had landed on a beach about a half mile east of the planned disembarkation point. This bit of good fortune placed this force directly on the left flank of the endangered beach. The commander (yet another gallant warrior whose name is lost) had seen the battle on the beach in front of Aristonautes and once his force had been assembled and mounted, he immediately launched a cavalry charge to the assistance of his commander. (This cavalry leader was granted "The Squeeze" and was admitted into the Immortals) Additionally, the remainder of the shipping that had straggled from the main force appeared over the horizon and were due to land shortly. These events forced the Centaur commander to retire into the town. This was no rout. The Centaurs retired slowly and grudgingly making Draco pay in blood for every foot that his force took. The entire flanking operation from Aristonautes was totally ruined. Draco's infantry took nearly fifty percent casualties, but they did get the town and port preventing reinforcement by sea, and providing a port of embarkation for any possible contingency. Draco had no other choice to push the Centaurs as far back from the port as possible and then go east and try to communicate with the army commander. As it was it was, Xena's arrival on the Corinth plain that finally broke the resistance of these Centaurs who retired in good order into the mountains south of the Corinth plain. Draco was shocked and put off balance by this failure and he didn't find and take the opportunity to strike a large part of Tyldus' army in the right flank as Tyldus retired in a southwesterly direction west of Corinth. "Draco was late" continued the interviewee of the scroll. "However, I confirmed his story after the action that his tardiness could hardly have been avoided considering the false intelligence reports on which we based his assault. His performance did not demonstrate loss of honor, yet he seemed stunned and depressed. I feared that this would effect his further performance. His confidence usually rose with a reward, so I guaranteed that his wing would be his when the army was reorganized. He performed well afterwards. Estrogon did what he was ordered and his assault went in north of Epiduros as planned. The assault was altogether successful, and there was no opposition. This had not been taken into account in the planning. Faced with this unexpected boon, Estrogon used his head. Xena had been concerned with the possibility of Sisyphus making a deal with either Tyndareus or Orestes for reinforcements. On his own initiative, Estrogon sent a reconnaissance in force westward into the mountains and made contact with the brigands that Xena had bought earlier. From these brigands, Estrogon got the news that heavy forces were indeed headed north towards Corinth. So, not wanting to confront significant enemy forces, Estrogon felt it was his duty to link up Xena as soon as possible. This advance was delayed to an extent by looting by the Immortals. Much wine and food was liberated on their route north. In retrospect, considering the political immobility of the cities of the Peloponnese and Draco's failure at Aristonautes, these one thousand elite troops would have been better used under Draco's command. Again the extreme mobility of the Centaur proved a great frustration to the Warrior Princess. Marcus pushed his cavalry division as hard as humanly possible but Centaurs are faster than horses and riders by a large extent. Tyldus just pulled away from the Nubian. However, Marcus's pressure had a solicitous strategic effect; Marcus didn't allow Tyldus enough time to reorganize a defense on the Corinth plain. As a consequence, the man horses were driven completely off the Corinth plain into the mountains. Xena realized the opportunity and the threat of Tyldus rapid retirement. It meant that Corinth could be invested without any significant fighting. Xena knew that Sisyphus garrison at the city was small and that after a relatively short siege, the city should fall. The danger was from any significant reinforcements coming to the aid of Tyldus. If Tyldus could yet be brought to battle the entire Peloponnese could yet fall. By this time Estrogon had sent messengers to Xena reporting his position and his discovery that large reinforcements from Sparta and Argos were due to arrive at Corinth in the near future. Would you like wine or cheese? So leaving about five thousand troops to invest Corinth and begin siege operations, Xena whipped her army south into the mountains to try to take the passes that blocked the way to Argos Mycenea, and Sparta. She hoped that by her hard pursuit, even though she was falling behind, her demonstration of resolve would force a political settlement upon Sisyphus and Tyldus. In this political assessment Xena would prove to be wrong. She was to be proved wrong in her belief that Tyldus was beaten as well for when she followed the main Corinth Sparta road south into the mountains she met the shock of her life. There were three heavily fortified hilltops chock full of Centaurs, well equipped and supplied, who were spoiling for a fight. Xena's problem was that she wasn't in the Battle of the Passes initially. Since her troops and many of their officers lacked experience in siege operations, Xena deemed it necessary to stay with the forces that she had allocated for the investment of Corinth. She left the pursuit to Darfus who pushed forward as hard as he could. Marcus had let his enthusiasm for the pursuit get away with him. In the belief that he was pursuing a broken army Marcus, as well as Darfus failed to undertake proper reconnaissance of the mountain roads. Whereupon both fell into two gigantic ambushes south of Khilomadhon. The terrain is rough and heavily wooded. Here the Centaurs had set up hidden lateral positions that covered either side of the two roads in the area forcing Marcus and Darfus to run gauntlets of well aimed arrow flights. This was a double shock because both commanders were convinced that their superiority in human infantry would be decisive in bad terrain. Neither commander had any idea that these positions had been established weeks in advance of their assault. Deployment was extremely difficult and horseman found the going nearly impossible. After hours of intense fighting, and heavy casualties Darfus was able to outflank the ambush on the center road and break through to a large clearing around Keto Ktenia. What he found was that the tops of three mountains between 800 and 1000 meters in height were heavily fortified. At this point a rider, was sent back post haste to summon Xena. In the interim, Darfus called a meeting with Marcus and ordered him to try to find a way to flank the positions to the west while he tried to carry the position in front of him by assault. This order Marcus protested but Darfus threatened him with cowardice and The cavalryman complied reluctantly. Marcus tried to side slip the position to his right but found that a further mountain had been prepared for defense and the terrain farther west was nearly impossible for any kind of troops to pass. This information was relayed to Darfus and to Xena as well. Whereupon Darfus redoubled his efforts to take the mountain immediately to his front. Darfus was an extremely aggressive and vainglorious commander who many times did not calculate results very effectively. In situations where extreme speed of movement or bold tactics were required he was highly effective. He was a ruthless commander who drove his men continuously to the breaking point and he was not afraid to use the most brutal means necessary to fulfill his ends. But, like Marshall Bernadotte's relationship to Napoleon, Darfus might have won often, but Xena could not trust him for long without supervision. It is here that Darfus' vainglory got the best of him. Tyldus had chosen his ground well. The sides of the three hills commanding the passes were very steep and it was a laborious process to get all of his Centaurs into the walls that he had built, but once the redoubts were manned all of the passes were in easy range of his archers and the catapults and ballistae that ringed those walls. Each hill had a fifty yard or farther field of fire and the cleared areas closest to the walls were studded with sharpened stakes, tiger traps (brutally effective as late as the Vietnam war) and other surprises. The walls of the stockades were counterscarped making it difficult to set up a ladder. Fire arrows were ineffective since the wood that made up the forts was green. The passes themselves were blocked by fallen trees, booby traps and the smallest passes were blocked by landslides making it nearly impossible to outflank them. Nevertheless, Darfus attacked. This misjudgment would have great consequences for Xena after the campaign. Darfus ordered an immediate assault on the center of the three hills. He threw close to fifteen thousand infantry against the hill only to have the assault stopped cold before it reached the walls. Darfus infantry, like most of Xena's forces were without shields or helmets and they suffered greatly under the hail of stones and arrows that erupted from the walls. Darfus also had no medical facilities available The first assault was a disaster with Darfus's force taking nearly 33% casualties. The attacking force was routed and it took Darfus several hours to restore order. In the interim, he deemed that the smaller western fortress seemed to be a better target, but there was extreme difficulties in shifting the troops to that target delaying the assault. The assault finally did jump off. but the battle reached the same result as in the earlier action. A third assault was attempted on the far eastern hill but when Xena arrived and assessed the situation she immediately halted the attack. Xena had been informed of Darfus' decisions by her communication with Marcus. Although Xena was privy to information about the possible approach of reinforcements from the south, and that Darfus could not have known about them, Xena immediately relieved Darfus for his bad judgment in attempting to carry the Centaur positions. Darfus, with great bitterness, was sent to the rear to supervise the construction of the siege works around Corinth. From then on, Darfus began quiet agitation with his men claiming that Xena was a coward and not worthy of leading the army. Xena realized that with the construction of the stockades in the hills, Tyldus had reversed the strategic situation. Xena's entire offensive depended on carrying these hills. Now that these hills and the passes beneath them were denied her, offensive operations to the south were impossible. There was good defensive terrain in abundance in the area but a strategic defensive here would not have been useful in forcing a political settlement on either Sisyphus (who was still outside Corinth with Tyldus) or on Tyndareus or Orestes. Tyldus had to be forced to battle and destroyed to do that. Additionally, Xena's supply line was extended and vulnerable. The mountains and forest had little loot available and all of the provender for her army would have to be brought in. The cover in the forest was perfect for the setting of ambushes and the conduct of hit and run raids by either regular forces or guerrillas. Therefore, Xena was vulnerable where she stood. She had to have ground of her own choosing and the best ground she possessed was the Corinth plain. Therefore, she chose to defend it.